The NYC-based post-punk duo plays O'Leaver's May 1. 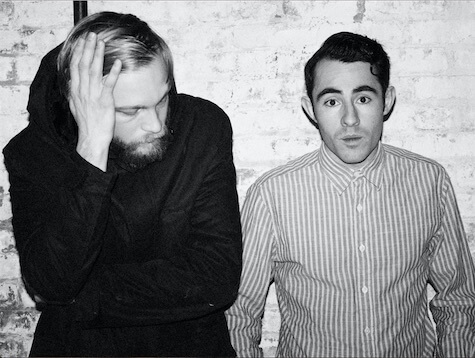 New York City-based duo Iska Dhaaf’s beautiful, tonal, layered, electronic songs pulse with pop-click-bang rhythms that race like a jackrabbit’s heartbeat. On their new album, The Wanting Creature (2016, Brick Lane Records) Nathan Quiroga’s and Benjamin Verdoes’ voices intertwine in an elegant, ghostly ballet that perfectly complements their songs’ haunting stories of modern life with all its complications. The “Chicken Song” that they play at roller skating rinks. Also, that song by Edwin McCain, “I’ll Be,” or whatever it’s called, is a close second. I hate these songs with a deep unbridled passion. I resent the question, because now they’re stuck in my head. Writing songs and traveling around the world with my best friend to perform them. Business/promotion is probably the worst aspect. Orange juice, or most variations of fruit. In general, even in the worst venues and towns we find a way to enjoy ourselves and connect with people. There have been plenty of strange and sparsely attended shows, but they’re all valuable. Strategically and usually with a sense of unease. Writing novels, short stories, or films. I would hate to be a mortician. I haven’t heard that many. Most of them are in songs that came from Saddle Creek bands. Nate saw his first Fire-Fly there, though. That’s a nice story. Iska Dhaaf plays with Annalibera, Haunted Gauntlet and Mike Schlesinger & Sean Pratt Sunday, May 1, at O’Leaver’s, 1322 Saddle Creek Rd. Showtime is 9 p.m. Admission is $5. For more information, go to liveatoleavers.com.